Tim Burton’s movies mean what he wants them to mean. The devil in that sentence is that Tim Burton is not fond of meaning, or, to put it in an Alice-way, he sometimes believes in “as many as six impossible things before breakfast.” Why would Tim Burton then turn to Alice’s madcap adventures? Why would he turn to the Batman, whom he sees as a dark, brooding presence perched above Normalcy? 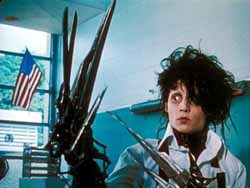 Or to Scissorhands, an outcast Wonderland creature hidden just outside Pleasantville? Or to Ed Wood, a movie director who preceded Burton himself “down the rabbit hole”? There seems to be a thread to follow here, a white rabbit to pursue, although a Salon reviewer feels “[t]here’s no compelling thread to follow here.” (Stephanie Zacharek, “Tim Burton’s Alice in Wonderland,” March 4, 2010). Some years ago I read a review of Burton’s Sleepy Hollow that found the film to be spectacle without substance. Burton has nothing to say. No compelling thread. But I found in Sleepy Hollow the same subject matter Burton had been drawn to in his Batman films, in Beetlejuice, in Edward Scissorhands, in The Nightmare Before Christmas, in Ed Wood. I found a confrontation between the conventional and the strange, the social order in its normative mode and what that social order cannot dream of: entrenched, stable identities running into disturbing differences. Running into dreams. So I’m not surprised that Burton would sooner or later turn to Lewis Carroll’s own brilliant forays beyond our inscribed notions of sense, order, reason, logic and necessity. Doesn’t being in our post-post-modern Millennial clime mean that we now know we live in narrative bubbles of our own cultural creation, have absorbed that shock and are now just dealing with it? We’ve gone on. 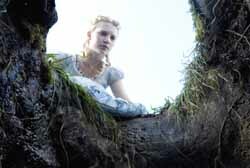 Or are we now, as the White Queen informs Alice, “living backward”? We go down the rabbit holes of our own creation and are more than queasy about calling a rabbit hole “Reality,” and certainly in our Millennial, multicultural, globalized world nervous about subjecting those in other rabbit holes to the truths and laws of ours. You might say that the Millennial Mass Psyche has caught up with Tim Burton and Lewis Carroll. This may very well be the reason why the Salon review found nothing compelling in Burton’s Alice and another review found it boring: Burton is no longer presenting what we can’t dream of, what we feel we can’t master. He’s not exceeding in some provocative, obsessive manner our grasp. We are complicit with the film’s disclosing — co-directors, if you will. We are, in short, still curious but not curiouser. We may have jumped the hurdle of potential disaster and reached the other side where things are quite like what they were. We may have decided that no jump was required and that we had simply made a wrong turn back there and business can go on as usual as long as we trash everything that led us to think we had to jump from the old to the new, from the familiar to the unknown, from one comfortable way of looking at things to an odd way. We may only think we’ve jumped clear but are actually sinking in dark, odorous muck. We may not choose to jump or know that a jump was required and if it was required, what had it to do with us if we chose to believe that it had nothing to do with us? In this last — call it my personal choice trumps everything — we’ve mastered every aspect of the dilemma in a Humpty Dumpty fashion: everything means “just what I choose it to mean.” Or not. 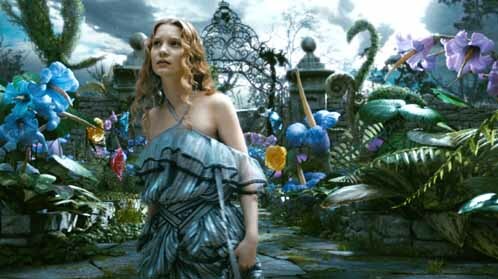 It’s a “living backward” choice and it’s one that Tim Burton hasn’t made until now, until Alice. It is true, of course, that he has clearly preferred the joys of “living backward,” of retreating to a realm of Blakean innocence and imagination. Nevertheless, the world outside Burton’s imagination has not been checkmated, or even put into check. The dark, threatening realm of Experience still lurks. It’s the brooding darkness of Batman’s Gotham City. What the new Millennials’ Alice learns, however, is that her choice does put the whole world into check. She wills herself to be master, rather in the way Oprah touts The Secret of Life as no more than a projection onto the world of a personal will. It’s also the choice that the new Millennial or We Generation has made, or, more accurately, a jump made and not a choice because choosing requires awareness of choices. This is too simple, for both Lewis Carroll and Tim Burton. We must be curiouser. We need to learn from Alice here and walk backward. 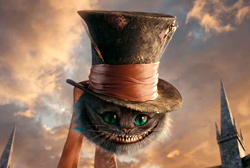 A reality riddled by Chesire Cat questioning that cannot simply be chopped off by personal decree is partially the creation of Tim Burton’s work. When he began to enframe us within it, he left us with the residue and remnants of agitating dreams, dreams on the edge of understanding, dreams that drew us deeper into themselves so powerfully that they were not ours but somehow ours. If we were moving to a new awareness of ourselves and our world, that work could not be relied upon to be done by the old awareness. Presently in our Millennial clime we live within a frame of questioning that remains unresolved, but, in fact, includes a sense that the questions have been answered, a sense that the questions have dissolved, self-destructed and gone away, and a sense that there is nothing to resolve or dissolve if one chooses that there be nothing. Unfortunately, we cannot summon anyone’s work as a guide to where we are and how we got here. At the same time, something, as Joseph Heller put it, happened, and Tim Burton’s films are complicit. Now I find that Burton’s nineteen-year-old Alice is more complicit with than resistant to the view that difficulties dissolve by personal decree. What makes Alice a revealing departure from Burton’s usual imaginative visualization of our mass psyche is Alice’s link to “Generation We,” a “new generation . 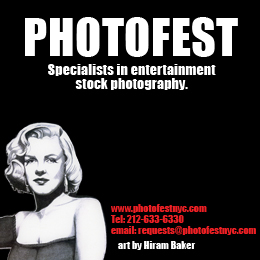 . . poised to seize the reins of history” (Greenberg and Weber). There are signs here that Burton has resolved — by “living backward” — the question of how to deal with the limitations of entrenched identities and societal norms, and has done so by reducing the whole enterprise to personal choice, will and determination. Alice learns to empower herself through her own personal choices, which I consider a retreat to a kind of narcissism of the “Generation We.” But that narcissism can be connected to a Romantic Ego, to childhood innocence, to a compelling tradition of recuperation and resolution extending from the British Romantic poets to Lewis Carroll to Freud to Tim Burton. The dark side of this narcissism is what you find in the DSM-IV, the delusions of an expanded and self-absorbed ego. A mad tea party where the narcissist, sitting side by side with embattled conservatives and radicals, makes her escape by contracting and reducing the matter to a personal one. We can take the vial that reads “Drink Me” and bring ourselves to a size that allows us to pass through the door and into a new world. Or we can take a bite of the petit four and grow to such a size that everything around us is diminished. A Journal of Personality study in 2008 reported a 30% increase in narcissism from the 1979-1985 mean. The Pew Research Center Report on the Millennial Generation “found that today’s young people are more diverse, optimistic and technologically reliant than older Americans” (Kate Stanton, NewsHour Extra Feb 26, 2010). The same NewsHour Extra on-line report quoted Scott Keeter of the Pew Report: “We know that young people tend to be optimistic in the face of tough economic times, but I think it’s especially interesting that there’s so much optimism considering that there’s so much unemployment.” Descriptive presentations based on survey polls and questionnaires, however monumental, must await interpretation. My interpretation is fixated on a 30% increase in what the DSM-IV describes as narcissism and I therefore read the poll results in this manner: Millennials are post-ideological because ideologies have historical roots, which means their solutions overwrite/override personal solutions, something narcissists will not abide; post-partisan because partisanship is collective not personal; post-political because all politics is personal for the narcissist. Why do the Millennials remain confident and optimistic in the face of the Great Recession and what is clearly a deep-rooted unemployment problem? Curiouser and curiouser. Could it be that in losing themselves in their own self-absorption, gone down the rabbit hole of their own design of cyberspace, the Millennials don’t know enough of the “off-line” world to be frightened, full of angst, pessimistic? Am I wrong in thinking that confidence and optimism are to be applauded when they persist in the face of a full look at the worst, and that confidence and optimism retained by ignorance is pitiable? But can the Millennials claim Burton’s Alice? “Who in the world am I?” the Cheshire Cat asks. “Ah, that’s the great puzzle.” Burton has answered this question of identity differently than he does in Alice in the Nightmare Before Christmas, for example, where the denizens of a Halloween reality try to reckon with a Christmas reality and discover that where you are creates who you are. The Halloween reality can’t help but translate Santa Claus as Santa Claws. Edward Scissorhands, whose reality is shaped by his scissor hands — in the same manner that Patrick Suskind’s character Grenouille in the novel Perfume knows the world through his nose, his remarkable sense of smell — cannot fit into life in the ‘burbs nor can the normal suburbanites adapt to him. Incommensurable realities. Identity is thus a product of where we are and when we are. “Who are you?’ the caterpillar asks, and any character in a Burton world before Alice would say “Tell me where I am and I’ll tell you who am I.” When the caterpillar is asked if this is the right Alice, he says she’s the wrong Alice. The “right” Alice, according to Burton’s script, is the Alice who will slay the Jabberwocky, which she eventually chooses to do. The “right” Alice, out of the rabbit hole and back to the “real world,” proposes a trade scheme and earns a place as a corporate intern. Once the lesson of Will to Power is learned, what better place to trot it out than business? What this Millennial Alice learns, and quickly holds on to, is that this is her dream and therefore everything around her is subject to her will. She finally chooses to slay the Jabberwocky because she realizes that the need to slay the Jabberwocky has not been imposed on her but scripted by her. Who you think you are is not confirmed in Wonderland but interrogated, disarranged, and rearranged. 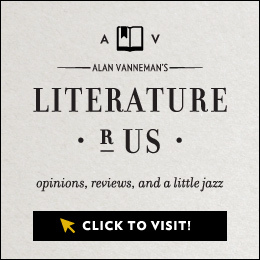 Every reader who leaves Wonderland and returns through the Looking Glass is hesitant in accepting as complete what language makes of us and the world; yet every reader remains fascinated by how we can imagine beyond — or under — such constraint and limitation. Burton’s Millennial Alice thinks the jump from the tired old place the world is to a garden of wonders is made by simply wishing it, or not. But perhaps that’s not all she thinks and that’s not all we are meant to think. She returns to the “real world” with all her Bandersnatch scratches clearly visible on her arm. Her will has not ruled totally in the Underland. The child matures because even a world of impossible things is a maturing world, a world that lies outside the rule of our own imaginations. Even a Millennial generation absorbed in its own self-empowerment cannot long remain in a “living backward” state but must learn of power, whether arbitrary or imposed, outside their own will. What both Lewis Carroll and an earlier Burton show us is that what the imagination can conceive and what limited imagination the world is bound to are two very different places. In believing that we can individually will ourselves outside of this dilemma we are indeed “living backward,” returning not only to late 18th-century notions of the power of ego and imagination but to notions of early human development, what Freud called a “polymorphous perversity” by which infantile desires and appetites could absorb world into ego. But childhood, as Lewis Carroll knew, is the place where the imagination lives, where it does not yet comply with a Humpty Dumpty rule, where it can break that rule and move on. To rediscover that is a “living backward,” a return to childhood innocence and imagination, what the Albert Finney character, Edward Bloom, in Burton’s The Big Fish yearns to do. The Millennials’ Alice then is “living backward,” before, not post, politics, partisanship, ideology. And this may be, after all, a wise response, impossible as it may appear.